Why Do You Need Construction Insurance? Your construction insurance can make the difference on whether your construction project makes a profit or loses money. To not lose money, it is important to make sure you have the right coverage. The coverage you require will depend upon factors such as the size of your company, the number of employees and the type of work you perform. General Liability Insurance: General Liability Insurance for construction companies is coverage that can protect your business from a variety of claims including bodily injury, property damage, personal injury and others that can arise from your business operations. Builders Risk Insurance: You can think of Builders Risk Insurance as Construction Liability Insurance. For a site under construction, this insurance provides coverage for onsite property damage. Professional Liability Insurance: If your business provides consultation, this form of insurance can protect your organization. This form of liability coverage is designed to cover potential claims due to a loss that a client may experience from your services. Construction Vehicle Insurance: Construction insurance for vehicles is essential if you use any vehicle for construction or contracting work, and is an essential part of your business protective plan. It provides the coverage you need to avoid the potentially high cost of vehicle repair, medical expenses or potential lawsuits as a result of unforeseen auto accidents. 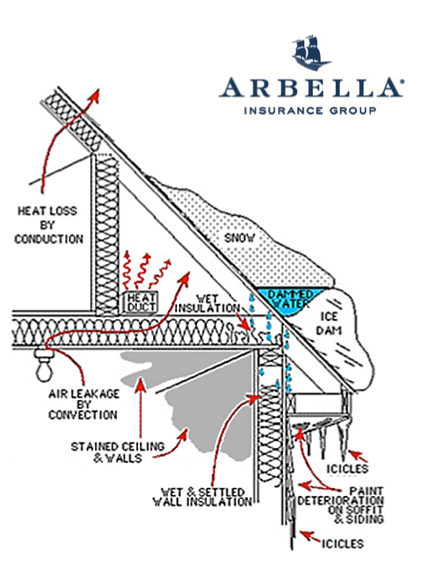 Arbella Insurance recently posted that significant snow events, such as the one New England encountered earlier this week, can often result in dangerous and destructive ice dams. Ice damming occurs when water from melting snow runs down the surface of a roof and re-freezes. As it re-freezes, ice builds up and begins to “dam” the subsequent run-off. Roof shingles are designed to shed water, not handle pooled water. Some of the pooled water finds its way under shingles and can refreeze, lifting the shingles from the roof deck and creating an avenue for the water to enter. This scenario is caused by warm air in the attic space, heating the undersurface of the roof deck and melting the snow. The run-off makes its way down the roof and eventually comes in contact with the deck over the eaves, which is not exposed to the heat from the attic. This is where the ice generally begins to form. • Keep gutters clear of debris and snow, including the bottom of the downspouts so that when the snow begins to melt the water may flow freely. • Roof rakes can be used to remove snow from the roof and gutter line. BE EVER MINDFUL OF THE PRESENCE OF ELECTRICAL WIRING WHEN USING A ROOF RAKE. licensed and insured contractor to complete the work. used. For added effectiveness, we suggest placing it in a nylon stocking, which allows for the agent to remain in place for a longer period of time and to be released gradually, extending the melting process. For many, the experience of obtaining surety bonds in the past may have been a long and arduous process. This is unfortunate as with the proper coaching and guidance a flexible and supportive relationship can now be established in a very short period of time and with minimal effort or consternation. Surety bonds are a consistent component of all public construction projects as required by the Miller Act on federal government work and state specific “little Miller Acts” on state and municipal work. This guarantee can often find its way onto private, commercial jobs as well based upon the owner’s or lender’s demands. Hence, by not having access to a surety program a contractor may be passing up valuable opportunities and struggle to obtain the backlog they need to achieve growth and profitability. Unlike purchasing insurance, a surety bond is a three party guarantee which is underwritten on a credit basis more similar to a bank loan. Consistent with this statement, surety underwriters will request most of the same data as bankers including past year end and interim financial statements, tax returns and other background details on the company. In order to be best positioned to obtain the most fitting terms for support, the contractor will need to identify a professional bond agent who will act as a “coach” throughout this process. Carefully selecting this representative is an extremely important part of the equation as your fate lies in their hands. Experience and reputation are paramount and the contractor will want to make sure they feel comfortable with this individual as sensitive company information will need to be shared with them. The agent will then be responsible for not only translating the contractor’s information into a format most readily understood by the underwriter but also for their extensive knowledge of and access to the proper surety companies to satisfy the particular need. This is definitely not a “one size fits all” industry and in the end the agent with access to the most surety companies and having solid relationships with each will ultimately have an advantage in identifying a happy home for the placement of the bonding. Conditions in the marketplace have recently “softened” with underwriters become more aggressive with the support and terms they are willing to extend. This is the result of the industry being profitable for the last several years and has caused numerous new entries within the last 24 months. Many of the companies underwriting surety bonds are actually departments or divisions of much larger insurance carriers and, compared to recent insurance results, the surety results have been extremely strong. This being the case, upper management teams want their “piece of the profits” and they mandate growth in this specific sector. If you are a contractor who has not yet put in place a surety program or is “stuck” with terms and conditions which are not favorable, then now is a good time to consider establishing a new arrangement. With so many options to choose from in surety companies now is an excellent opportunity to seek out the proper partner who will support you in achieving your business goals and objectives. Builder’s Risk Coverage: Why Do You Need It? Overwhelmed by the complex insurance issues that construction projects endure? Are you asking yourself questions like what types of construction insurance do I actually need? Well, one is for certain: Builders Risk Coverage. Builder’s Risk is a type of property insurance specifically designed to cover property during the course of construction, including renovation and repair. You need it because there are risks associated in this type of work that a typical property policy is not designed to cover. For example, if someone steals your construction equipment or materials, you could be liable for the loss if you are uninsured. This coverage is usually purchased by either the property owner or contractor. Regardless of who purchases the coverage, all parties that have property involved in the project should be named in the policy. This may include the owner, contractors and subcontractors. It can even include the financial institution funding the project. Builder’s Risk coverage only deals with the property, and does not include coverage for work related injuries. For any mishaps that occur on the job, you should rely on liability and workers’ compensation policies for coverage. One thing to be careful about when purchasing Builder’s Risk coverage is the policy period. Many people are confused about when the coverage begins and ends. It is important to keep in mind commencement of coverage. Most contracts require that insurance be provided the duration of the contract period. For more questions or concerns about Builder’s Risk coverage, contact us today. 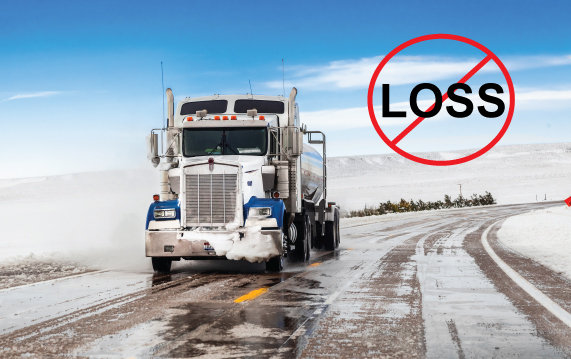 The winter season is the most common time of year for construction companies to endure loss. Why? Because during the cold months, business is slower, companies are not utilizing equipment and workers are more susceptible to injury from the harsh weather conditions. To lower risk, you must make sure your employees practice the appropriate safety precautions during these months. Properly training employees, equipment maintenance, and having the right construction insurance policy are all ways to make sure your business remains secure. Equipment theft is the biggest loss that construction companies endure in the winter. It is reported as a significant problem in the United States as well as Canada, Australia, Europe and Japan. 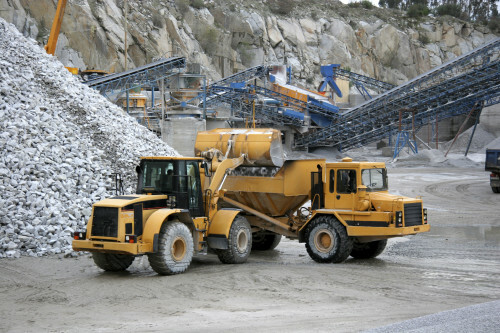 Construction equipment theft occurs year round, however during the cold months claims seem to spike. This is because of a few reasons: Days are short and it becomes darker quicker, construction companies are generally slower, and employees are not using the equipment as much due to weather conditions. Generally, construction equipment is also believed to be targeted by thieves because it is also poorly secured, easily disguised and very expensive. They typically remove all identifying numbers before reselling the items, often to unsuspecting contractors or overseas. In the United States alone, the National Insurance Crime Bureau estimated that more than $1 billion in construction equipment was stolen each year. During the winter months, rear-end collision claims are at their highest due to harsh weather conditions. Rain, snow, slush, ice and high winds can affect a driver’s ability to see in front of them, stop in time, and keep the automobile within the lane. Also, many more road defects occur during this time. Potholes, bent stop signs or other road signs covered from foliage, and non-working traffic signals can all contribute to a rear-end accident. Work- related injuries, such as back injuries, peak during this time of year due to slips and falls. Ice, snow, sleet and high winds are all factors into these types of accidents. Employers must evaluate snow removal tasks for hazards and plan how to do the work safely. A surface that is weighed down by snow must be inspected by a competent person to determine if it is structurally safe for workers to access it, because it may be at risk of collapsing. Snow covered rooftops can hide hazards such as skylights that workers can fall through and electrical hazards may also exist from overhead power lines collapsing. There are many ways you can prevent risk for your company during the harsh winter months. Keeping your business equipment properly secure, training your employees on safe driving, and knowing how to work safely in snow and ice are all precautions you can take to remain protected. Above all, having the right insurance for your business will help you in any of these losses occur. We are construction insurance experts and understand that the purchase of additional insurance is not always the best solution. We will listen to your needs and help your business by tailoring a program to your particular operation. ConstructionInsurance.com helps you find the most quality and affordable insurance for your construction company. Just complete our easy quote request form, and a member of our professional staff will contact you to help you get started. They will be able to guide you on exactly how much insurance you need and answer any questions you might have about the coverages we offer. 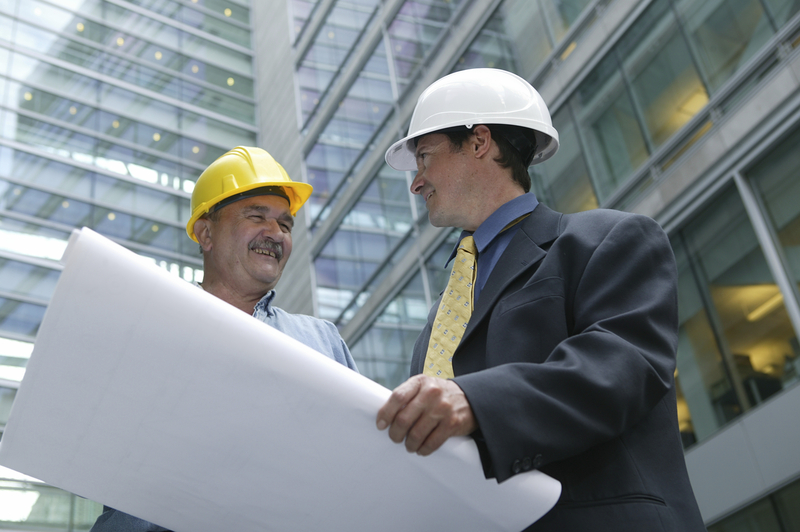 Looking for quality and affordable construction insurance for your organization? Our promise is to provide the easiest process and most competitive rates for our clients all while delivering professional expertise and exceptional customers service. Call us at 844-326-7647 or submit a quote request online. © 2017 Internet Insurance Group, LLC. All rights reserved.